The last full ‘declaration’ by the leading Port houses was for the very fine 2011 Vintage. 2015 came painfully close, and we were hugely impressed by the ‘Single Quinta’ releases last year. How good must 2016 be to have trumped those superb 2015s? There has therefore been a palpable sense of excitement in anticipation of this new Vintage. Having now tasted all the wines in this offer, it is a relief to confirm they are delicious. 2016 is a super vintage, with almost all the wines beautifully poised and refined – if not quite as intense and powerful as the 2011s. What they perhaps miss in ‘grunt’ – they make up for with finesse. They are dangerously inviting already – and a joy to taste. As is so often the way it was not a straightforward year. Mother Nature was in charge from the outset. A wet start is not always a bad thing in the Douro, as ground reserves of water can often benefit from replenishment – however, the cool and damp conditions pushed on into May and caused some major issues for farmers who lost considerable quantities of their fruit to rot at this time. This slow start meant everything was behind schedule in the vineyards – but in June things settled down and the vines got back on track, developing nicely. From this point on, a near perfect season was needed to ensure brilliance – and fortunately, this is almost what they got! The summer was hot and dry, and growers were delighted with well-timed rain falling towards the end of August. The high heat of the summer lead some to start picking in early September, but the best wines have been made by those who held out and waited for the next rains to pass on the 12th-13th of September. For the bold, harvesting started late, well into the second half of September and this made all the difference. Giving the grapes more time on the vine softens the tannins and develops both greater complexity and finer aromatics. It is these grapes, picked in the last weeks of September – and even into October – that have made wines balancing brilliant finesse with sublime intensity. 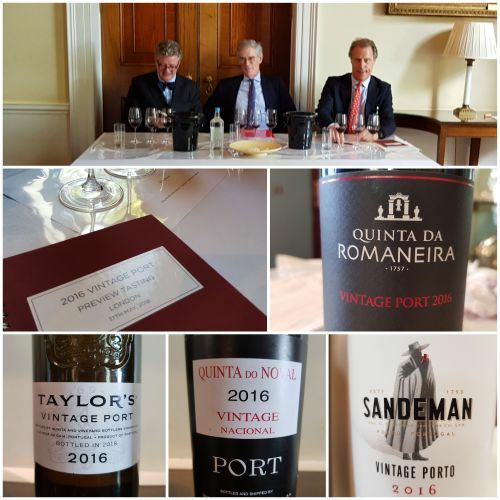 2016 has produced very refined ports that really showcase the constant improvements being made by diligent producers in the Douro Valley. As all the growers told us, this is a year that was only successful for those who really understand their vineyards and were keeping a close eye on each vine throughout the season. These are super Vintage Ports. They represent a great buy for lovers of great wine. The relationship here between quality and price is hard to match in any corner of the fine wine world. We anticipate they will be fantastic to drink in the medium term – if you can wait, as they are almost immediately svelte, gentle and enticing. These wines are all offered on a pre-shipment basis. They are still in Portugal and will be shipped to the UK in November. Not only is this usually the cheapest moment to buy the wines but also your best chance of ensuring you don’t miss out on this small but brilliant vintage. Some of these wines are also available in Halves and Magnums – Please ask.